Is a Major Stock Market Correction Now at Hand? 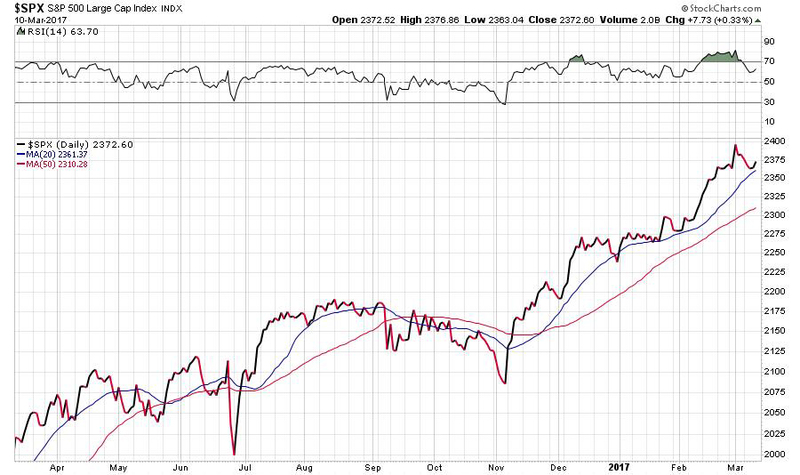 The S&P500 Index (SPX) is once again flirting with its 20 day moving average which has defined underlying support for the SPX since the current rally began with the Trump election victory. The SPX has not had consecutive daily closes below its 20 dma (the blue line in the following chart) since early November; it has touched its 20 dma numerous times but closed below it only once. The pattern continued last week when the SPX rebounded after trading just below its 20 dma on Thursday. Based on the price action over the past four months, consecutive daily closes below the 20 dma could indicate that a significant correction has begun. Why is a correction likely? Extreme valuation is certainly a factor. As John Hussman points out, the average stock is now more highly valued than at any time in history including 1929, 2000 and 2007. See “The Most Broadly Overvalued Moment in Market History”, March 6, 2017. Serious over-valuation does not tell us that a correction is imminent but it does increase the risk. A bearish divergence between market internals and the senior indices that began to develop in December. For example, the market-cap-weighted SPX index is up strongly but the unweighted index is down, indicating that performance is limited to the largest capitalization issues. 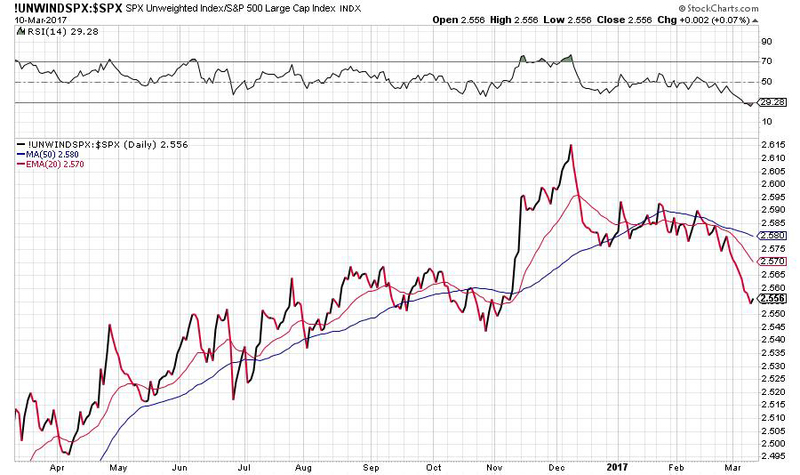 Below is a chart of the ratio of the unweighted SPX to the weighted average which clearly shows this important divergence. Sentiment, as evidenced by the Investors Intelligence bull/bear ratio is at extraordinarily high levels. Momentum oscillators such as the RSI show that the SPX recently became as ‘overbought’ as it ever gets (see the first chart above). Weakness in the T-Bond market. Higher interest rates put downward pressure on the stock market. The rapid draw-down of the U.S. Treasury’s cash account (as discussed in Sunday’s post) and a rapidly approaching debt ceiling issue. The downside break in the oil price and signs of weakness in the industrial metals markets. There is growing evidence of a possible return of deflationary bias which would weigh heavily on the stock market. 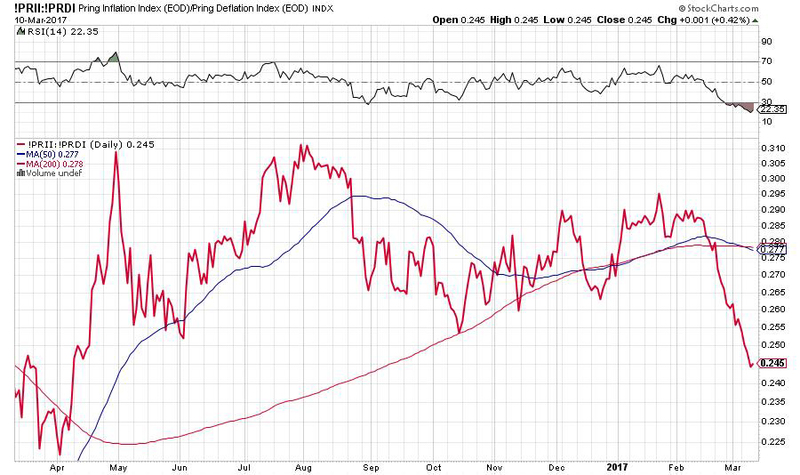 For example, the ratio of the Martin Pring inflation index to his deflationary index has recently begun falling rapidly, as per the chart below. Previous Previous post: U.S. Treasury Headed for Disaster?